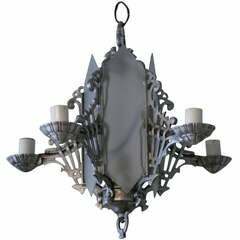 Five-arm geometric Art Deco chandelier with five hanging lights and light-up slat glass center. 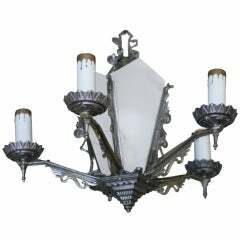 The piece features scrolling details throughout while the base of the chandelier features a geometric pattern. Code: 2013153. 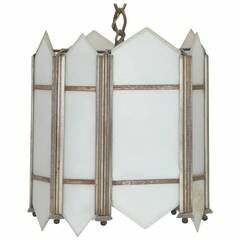 Made circa 1920, this Art Deco ceiling pendant has an intricate geometric design with slat white flash opal glass inserts. Art Deco molded glass hanging light fixture. Has brass trim and hanging links and cap.